Wait - Boulder Beer is in Boulder Colorado? Imaginative. As far as I know, there is no Nashville Beer, Inc. or similar, so I guess they have a unique kind of obviousness. 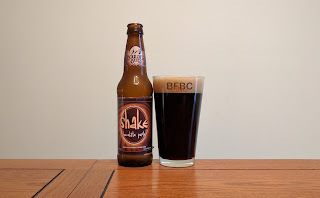 I'm not sure why this is called "Shake" but I complained about the name of the brewery itself, so I shouldn't keep giving them a hard time. I genuinely don't know how an apparent microbrew from Colorado made its way to Tennessee, but I won't look a gift horse in the mouth. The beer is a deep cherry brown like a very dark rendition of a cola. The head is thick and sticky with an aroma of coffee more than anything. I think I smell burned oatmeal, too, but I really wanted to smell the chocolate, and I'm not getting much of it at all. It's not that it's not mouthwatering - it's just not what I expected, and that's on me, not the brewer. First sip is a bit confused. It has some chocolate, but it's certainly not a defining characteristic. Instead, there is the burned oatmeal, some very nice vanilla, and some coffee. The chocolate is kind of background, and it mixes with a nuttiness to kind of give the impression of a peanut butter chocolate stout, but it's not overwhelming anything. This may be the best peanut butter chocolate stout that isn't labeled as such that I've ever had. We will know when I gulp. Tip-in is smokiness and vague dark chocolate with bright carbonation tickling the tongue. It's a brighter beginning than the dark beer would lead me to believe possible, and the middle brings more smoke, and it seriously goes so far to the back of the through that I am tasting with my throat. In the mouth, The tongue really doesn't get that much in the middle beyond a vague chocolate and maybe some grains, but the beer is smooth. The finish is a crescendo of taste featuring vanilla, the peanut better, chocolate, oats, coffee, and smoke. The finish is strong and earthy. Bottom Line: I'm glad I got six of these. It's a flavorful, but approachable beer.